Where's the Independent Voice Among Justices Appointed by Democrats? WASHINGTON -- As Justice Anthony Kennedy prepares to retire, all eyes in Washington will be on the battle to confirm whomever President Donald Trump nominates. Prepare for warnings by Senate Democrats that the new nominee will not be sufficiently "independent," as Senate Minority Leader Chuck Schumer, D-N.Y., and others said last year of now Justice Neil Gorsuch. An appointee of President Ronald Reagan, Kennedy was reliably independent, the famous swing vote who at times stood with the four fellow justices appointed by Republican presidents and at others with the four appointed by Democrats. On the high-profile political decisions, the four justices appointed by Democrats pretty much can be counted on to vote as one. Independent? No, they're too high-minded to deviate. Even when it comes to free speech. Wednesday the court issued an opinion by Justice Clarence Thomas that ruled against the Freedom, Accountability, Comprehensive Care and Transparency Act, a California state law that required anti-abortion pregnancy clinics to post information about where women can find free or low-cost services, including abortion. The 2015 California law violated freedom of speech as protected in the First Amendment, Thomas opined, as it forced individuals with deeply held beliefs against abortion to promote the procedure by posting a "government-scripted" speech. The legislation should be as offensive to free speech fans as a law requiring that abortion clinics distribute anti-abortion material. And yet four justices dissented with the decision in NIFLA v. Becerra. They are Stephen Breyer and Ruth Bader Ginsburg, who were nominated by President Bill Clinton, as well as Sonia Sotomayor and Elena Kagan, who were nominated by President Barack Obama. The California law is the sort of legislation that states pass when they are heavily weighted to one side and want to use that weight to force their views on others, even after they've won the day. Abortion is legal and readily available in California. According to the Guttmacher Institute, "California does not have any of the major types of abortion restrictions -- such as waiting periods, mandated parental involvement or limitations on publicly funded abortions -- often found in other states." So with no legal or financial hurdles facing women who want to terminate their pregnancies, what do abortion-rights advocates do? They go after people who disagree with them. They argue that abortion opponents mislead pregnant women and that pregnant women don't realize what type of clinic they have visited. And they pass a law that requires abortion opponents to do their pro-abortion advertising for them. Breyer wrote that the California law cannot be considered "viewpoint discrimination" because the law is purely informational. It doesn't require that anti-abortion clinics endorse abortions, he argued, but simply requires that licensed clinics inform pregnant women about the medical care available to them and that unlicensed clinics inform women that they do not provide medical services. Breyer compared the California law to legislation that requires signage for seat belt use, the location of stairways and garbage collection. Writing for the majority, Thomas chided the Ninth Circuit Court of Appeals, which upheld the FACT Act on the dubious grounds that it applied to "professional speech" -- as the court never has recognized political speech as less worthy of protection. As for the law's alleged goal of informing the public, Thomas wrote, the state could wage a public information campaign instead of forcing people who oppose abortion to advertise it. Kennedy agreed with Thomas, but wrote a concurring opinion to address the insidious issue of "viewpoint discrimination" and "the serious threat presented when government seeks to impose its own message in the place of individual speech, thought and expression." Keep in mind that Kennedy, a devout Catholic, upheld Roe v. Wade in the 1992 Planned Parenthood v. Casey ruling and opposed a Texas bill to restrict access to abortion in 2016. 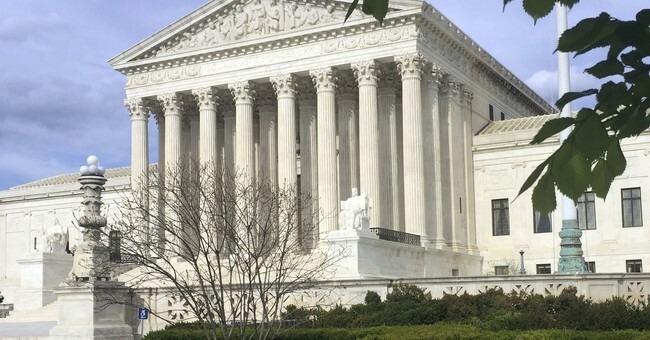 But with free speech at stake, Kennedy continued in his NIFLA v. Becerra concurrence: "For here the State requires primarily pro-life pregnancy centers to promote the State's own preferred message advertising abortions. This compels individuals to contradict their most deeply held beliefs, beliefs grounded in basic philosophical, ethical, or religious precepts, or all of these." That violation of the First Amendment Kennedy could not abide. In the coming weeks, you'll hear critics charging that Trump's pick is not sufficiently independent, that he's no Anthony Kennedy. They do not ask: Why is there no Anthony Kennedy on the left side of the big bench?